Creating a vision board can be a great way to stay focused on a goal and maintain motivation to achieve it. 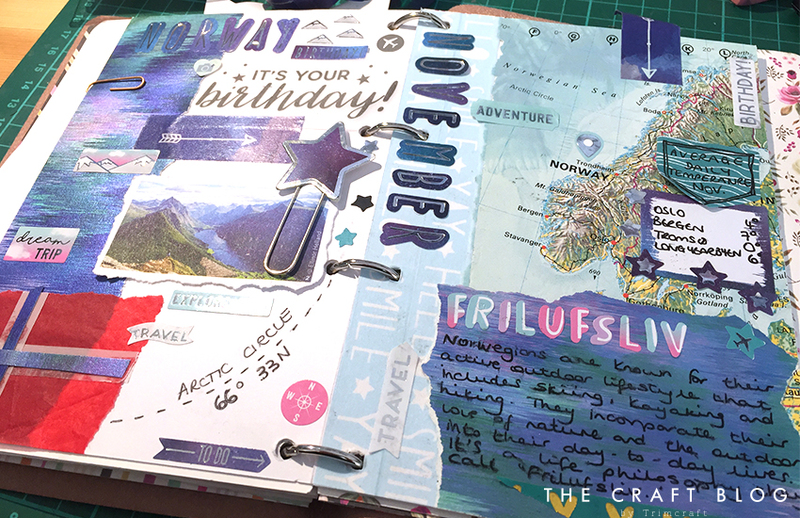 Here Kathy tells us how to go about creating a vision board in your planner, travellers’ notebook, journal or notebook. A vision board is a creative visual representation of your goals, dreams and intentions. It’s something you can refer back to and can act as a visual reminder about your goals and should help motivate you to achieve them. However, a vision board will not work on its own. It can help you achieve goals but it’s not magic. It can’t achieve them for you. Remember to plan your board with this message in mind: “it’s not what you want to get, but what you want to achieve”. There is no right or wrong way to create a vision board, as it’s a personal project that is unique to you but it can help to look at other boards for inspiration. What should a vision board cover? Your vision board can be on any goal, dream or topic you like. Have a think about where you would like to travel to or visit. Are you looking at making home improvements? Is it a career goal or health related? Or is it a specific event such as a wedding or the arrival of a new family member? Vision boards can be used for absolutely anything you’re working towards or striving to achieve. You might also want to put a timeframe on your goal. Is this something you will achieve before a big birthday or milestone, or is it something you’re planning to complete this week? It’s totally personal and up to you! A vision board can also be something that evolves. You may find that you want to add to it over time as and when inspiration strikes. It may never be completely ‘finished’, particularly if your goal is an ongoing one such as staying healthy or being more organised at home. The clue is in the name! Your vision board should be something that you can see easily so that it reminds you to stay focused on your goal. I like to add a large clip or tab on my vision boards so that I can easily see them in my planner. You might want to make them even more visible by putting a copy on your wall or notice board. At the UK Planner Addicts event, one planner told me she is creating a vision mirror and is putting her goals and affirmations on her mirror so that she can see them every morning when she is getting ready. The main thing is that your vision board works for you. You can refer to it when making decisions, and ask yourself whether your decision will help or hinder you achieving your goals. You can also use it to motivate you and lift your spirits when you’re feeling less inspired. Before you start to gather the materials for your board, think about what your goal looks like and feels like. Who will be there with you? Is it a personal goal or will other people be helping you to achieve it? Also ask yourself why it’s your goal and how are you going to achieve it? These questions can help you to add quotes or words that will inspire you to succeed. Step 1 – Gather all of your materials. These can be descriptive words cut out of magazines, words spelled out by stamped letters or stickers, or can be words you add on the page yourself. Collect photos and images that represent your goal as well as swatches, quotes and magazine clippings. You might also need to do some research for example if your goal relates to completing a sporting event, look for the dates and venues of these events as well as training tips. If your goal is business related, note down the web sites of organisations and resources that you will need to look into or sign up for. You will probably end up gathering more than you need but you can always keep the excess in a pocket or wallet attached to your vision board or within your planner. Step 2 – Note down everything you want to include on a piece of blank paper. This can be a simple list or it can be your vision written down in the centre and all of your thoughts noted down around it. The most important thing is to get everything from your head onto paper. Step 3 – Plan or sketch your layout. You might want to do a rough sketch on plain paper or start to make pencil notes directly onto your planner page. This stage is to make sure you can fit on everything you want to. Refer back to your list from stage 2 to make sure you haven’t forgotten anything. And don’t worry about how your layout looks; there is no template for a vision board so it could be very structured and organised or it could be more of a collage style approach. Whatever works for you is fine. My advice is just to start somewhere! You might not finish your board in one sitting. In fact, you probably won’t, but just getting started and setting your intention to create a vision board can be helpful in focusing your mind and thinking about how you are going to achieve your goal. My other top tip is to always start in pencil and lay your materials out before you stick down. This allows you to change your mind about the layout or lets you include new things. I like to set my layout, take a photo on my phone and then refer back to it when sticking all of the items in place. Then I copy over any pencil lines with pen and rub out any remaining pencil marks. Link your vision board to other areas of your planner. For example a weight loss diary, exercise progress or spending tracker. This way, it remains visible and useful and will help you achieve your goal. Most of all, have fun. Enjoy the time spent mindfully crafting and don’t forget to share your boards in the Trimcraft gallery so that you can inspire others to achieve too. Will you be making your own vision board? What will your theme be? You can follow Kathy on Instagram here!